There are a couple of tricks to making paella. One is the rice. For beginners, I would highly recommend using Bomba rice from Spain. It has a shorter grain and is more “foolproof”. The other is to use smoked paprika from Spain. Smoked paprika gives a rich, lingering flavor and aroma to this dish. This really is a meal in a dish. Heat the stock in the saucepan until it starts to boil slightly. Reduce the heat to low to keep hot but not boiling. Crush the threads of saffron and add them to the stock. Heat the olive oil in the paella pan over medium heat. Add the onion and saute until translucent. Add the rice, smoked paprika and crushed chili pepper to the rice. Stir over medium heat until the rice starts to turn brown. Add the garlic to the rice and saute for about 30 seconds. Pour the stock over the rice. Add the wine. Add the chopped peppers, chopped vegetables, tomatoes, corn and salt. Stir well. Note: From this point on, you should not stir the rice again. Reduce the heat to a slight boil and let the rice cook for about 5 minutes. Add the English peas to the top of the rice. Let the rice continue to cook without stirring until the liquid has been absorbed. Turn the heat slightly lower to let the rice caramelize. This should take about 5-10 minutes. Watch closely the first few times to make sure the rice is browning, but not burning. 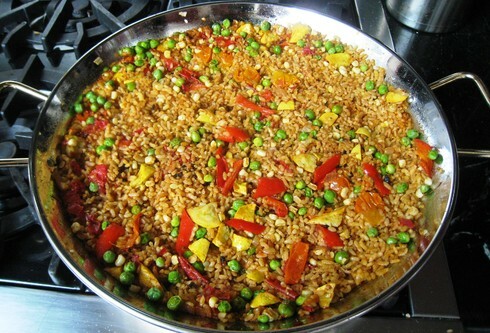 Remove the paella from the heat and let it rest for 5-10 minutes. Serve warm.